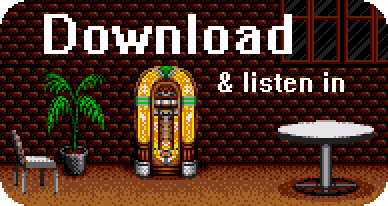 The VGM Jukebox: Ep. 70: Who Says Booyah? Dreams really do come true, especially if you've stolen some potion from Emily's inventory. Join her and Josh as they witness imagined game soundtracks come to life with the help of Ed from Pixeltunes Radio. Topics of conversation include Definitely Darryl's family, the nature of bass, the potential attitudes of Boos, the incongruity of medieval video games, and what makes something sticky. Then, hold on to your hats for a brand new segment, "Reading the Runes" wherein Emily recounts her adventures in Ultima IV. Finally, get ready to be dazzled by Mixxmaster's VGM beatboxing! Need I mention that these jams are jams? What are you waiting for? Slip into the bar for another shot of The VGM JUKEBOX! It's the electric guitar/synth lead that really gets me on this track and why it's my favorite song of the game! Something I did forget to mention in the submission is that this arrangement wasn't actually made for the Saturn version of Sega Rally originally. It was made for an album called "Sega Rally Championship Ignition" released just a few months earlier and was adapted into the Saturn port along with newly made songs by Naofumi Hataya. They even added a version of the credits song, "My Dear Friend, Rally" with lyrics! I'm sure Darryl and his family would definitely enjoy this album! Can't wait to hear your thoughts on the other songs I've submitted soon! Fun fact: Egad's voice is provided by Kazumi Totaka, who also composed the track! And Captain Olimar. And KK Slider. Dude gets around! Maybe that looks familiar, Emily? By the way, the first track in Mixxmaster's Mixx is the main theme to Dragon Warrior for NES (and the series in general). If your reading this, thank you for introducing me to this podcast! If it wasn't for that crossover episode you guys did a while back, I would have never heard of The VGM Jukebox at all. I'm really digging the idea of sharing these music tracks to others that might not have heard of them at all. Awesome! I'm glad I got to spread the word around, since VGMJB is one of my favorite shows and Josh and Emily are truly awesome people. First off, that Mixxmaster Mixx was awesome! Terrific job, man! I'm glad you played that track from Sword & Sworcery. For your episode info, note that it's actually spelled "Sworcery"....that wasn't a typo. That game gives lots of good feels, something which I don't get a lot from games anymore. Listening to (Josh read)my testimonial, I'm having a hard time understanding what it was about being labeled a mobile gamer that was so offensive to me. I think it's because in most circumstances, mobile gaming can accurately be generalized as a throwaway experience, much like Josh's story about eating junk food and consuming 3 different types of media simultaneously. Mobile gaming is something distracted people do to keep them from being distracted by something they find more distasteful. It's not often a deliberate experience that one does wholeheartedly. I'm so glad you're keeping the outtro line. I had meant to comment how much I love it, but I forgot until now. Coming from any other podcast, it would sound saccharine and cloying. However, because VGMJB centers around the Patrons' experiences attached to the music, I find it to be meaningful and appropriate. I have more to say but I should be working. Have a great weekend! I think the people that disparage mobile gaming are the ones that have the least experience with it. There are many games other than Sword & Sworcery that are just as deep and artful as console and PC games can be. Sure, the super-popular ones are the titles that seem to cater to the lowest common denominator, but there are rich puzzle games like The Room, gorgeous action games like Alto's Adventure, and fun community-based titles like Trials Frontier that make mobile gaming a viable platform. Don't count it out, because you'll miss out on some amazing stuff! You're right. The ironic part is, mobile gaming is nearly the only gaming I actually do these days. For the most part, I don't have time to sit and play console games. So the only gaming I do at all is occasionally on my phone or the DS Lite. There are some phone games I really enjoy, like Mini Motor Racing, the Infinity Blade Series, and The Silent Age. Thanks Nathan glad you liked it!!! Hey did you know that there is a version of Ultima IV for the Sega Master System released in Europe in 1990? That version also has support for the Japan-only Yamaha YM2413 FM add-on, despite that not only that the Master System version never came out there, the system was already discontinued at the time of its release. So if you wanted to get your Ultima fix on a Sega Genesis, then a copy of Ultima IV and a Power Base Converter (or Stone Age Gamer's Power Base Mini FM) would do it for ya. There is something I love about the experience of a surprising new arrangement of an old familiar classic, thanks Ed. As one who hasn't played F-Zero, I have to say that Mute City is the piece that grabbed me the most when I was discovering the soundtrack; it seems to be very popular on the internet too, though it is certainly second to Big Blue. These days I don't want to pick a favourite; they're all hits. It's funny you compared the Luigi's Mansion track's bass to a PSG, keyglyph, because I was listening to it thinking that it feels like a sawtooth bassline from a gameboy. Talk about a piece that is all earfeel! Ultima IV continues to fascinate, thank you for the segment. And when thou dost gaze upon my previous comment again then shall my life's location be revealed. I think a part of why Big Blue and Mute City are fan favorites is because they are the first two tracks, so they have the most familiarity. You heard these two every time you started the game, even if you never got past level 2. They are both well composed though, I'm not trying to say that the composition is not a major factor. I love this OST throughout. I just know that there is a lot of social psychology research that suggests familiarity is a more important factor to our liking things than we often give it credit for, and I think this often helps explain a preference for level 1 and level 2 music. Listening to this track got me to play F-Zero again. That is the rare racing game that doesn't lose its fun with age. It's still great. They got the magic right for making you feel like you're going too fast, but still just barely in control. I have a soft spot for F-Zero because it is the first Super Famicom game I played. There was a video game store near where I lived that imported some Super Famicoms before the Super Nintendo was released in America, and you could pay by the hour to play them to get a taste of what was to come. I have a visceral memory of how excited I was to play this that comes back every time I start the first race. The camera starts out from an overhead position, zooms down to the racing ships, then tilts and lines up behind them with this satisfying noise that goes "booooeeeyoooorrrraaaahh!" This pseudo 3D effect blew my fragile little mind back then. I was so excited to be playing the next Nintendo console before most other people and to see just HOW AMAZING IT WAS! Of course, 3D is everywhere now and we are used to it, but I try to remind myself of just how cool it felt when I first saw this Mode 7 effect. Wooooo! I was pumped and ready to race at max speed! In fact, I think I'm feeling ready to do so again. See ya. I'm off to play some F-Zero! I also wanted to add that the track selections were great this week, and I love how the "Booyah" serendipitously seemed to land at comedic moments in the conversation. It kept making me laugh. CORRECTION: Naofumi Hataya didn't compose Reckless Running! Takenobu Mitsuyoshi composed it and Takayuki Hijikata arranged it for the Saturn release. EB, do you think Takayuki Hijikata's credit in that sequence is for arranging? "Music Producer" seems... vague. If this is correct that Naofumi Hataya wasn't involved at all, though, you best start editing Wikipedia! It may need you! This arrangement is actually from a CD album called "Sega Rally Championship Ignition" (which is listed in the video) in which the production credits all arrangement by Takayuki Hijikata. These arrangements were reused for the Saturn release. Naofumi Hataya did compose new tracks for the Saturn version (i.e, replays and menus), just not this one. He wasn't involved in the original arcade version either. Ah, nice. I'll go ahead and change that. And yeah, one of the difficulties with crediting things properly is that we typically tag composers on the game level -- as in, any composer who worked on the game, we list. This is because 1) it's a ton of work (and sometimes not possible) to find the composer(s) of each individual track, and 2) we don't want to leave someone out who should be credited. It feels safest to put everybody's name on it -- although I know we haven't been 100% consistent about that, either. Maybe we should be more specific about saying "the composers for this game were" instead of just "the composers on this one were" during the show, to kind of cut back on confusion. Anyways, I'm going to leave Hataya's listing, but I'm going to add Hijikata. Thanks for the digging! Yeah, I think the general consensus amongst VGM podcasters is to list the full credits for the game on each song. As I've learned from speaking with composers in the past, they collaborate on songs more often than we're led to believe! It's confusing since in the Saturn game, Hataya has a "Music Composed by" credit but I am absolutely sure about this! Sometimes I wonder if the folks who decided on how to write up the video game credits had ANY IDEA the level of mayhem they were setting up for us in the future! It's hard considering that especially for older games tracking down who composed what particular song and even sometimed hidden under aliases. Sonic 3 for example has so many composers on it and that we dont know who did what. It's a tough job to get things right when it comes to game credits so I thank you guys for looking into it! Hey I was thinking maybe there should be an extra optional textbox in the suggestion form in case some one knows who composed the track, afterwards you guys can still check if it matches up. I think this might be good idea! Getting back to the idea of mobile gaming, it wasn’t so much the mobile games themselves that I found distasteful as it was the attitudes of some mobile gamers....although we could probably all agree that the free-to-play model is a blight. One of the negatives about mobile gaming is that the low price of entry has created the mentality among consumers that games should be at least nearly free and nearly perfect, where perfection is defined in the narrowest terms of an individual’s whims. Any deviation from this moving target incites scathing reviews about how this or that person finds such issues unacceptable ‘in this day and age’.